In time for spring 2008, a legend who left a lasting mark on the world of music returns with a new studio album: Mark Stewart. 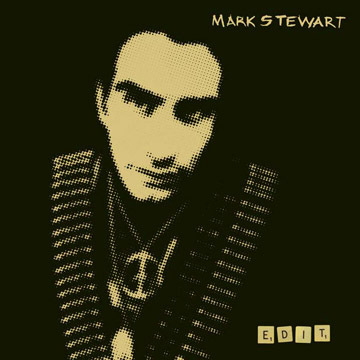 Created and recorded between London, Vienna, Bristol and Berlin, Stewart’s sixth full-length release, Edit, marks a welcome return to his solo career after numerous collaborations with, among others, Tricky, Massive Attack, Chicks on Speed, Adult and Primal Scream. To accompany the release, Mark will embark on a global tour in 2008. As teenage front man and mastermind of seminal Bristol post-punk legends The Pop Group (1978-80), Stewart already used his microphone as a weapon. In an era that saw public opinion and perception tainted by Thatcher, Reagan and the Cold War, The Pop Group emerged as one of Britain’s most radical exponents of new music and quickly gained notoriety well beyond the British Isles. Their until then unheard mix of punk, funk, dub, jazz and noise, countered by Mark Stewart’s scathing political slogans and lyrics (We Are All Prostitutes), easily counts among the most impressive, provocative and lasting manifestations of musical spontaneity seen, heard and experienced by the end of the 1970s. After the group’s dissolution in the early 1980s, members of The Pop Group re-emerged in a flurry of new bands and guises: Rip Rig & Panic (featuring the then still unknown Neneh Cherry), Pigbag (with their surprise Top 10 hit ‚Papa’s Got A Brand New Pig Bag‘) and Maximum Joy. After a short stint with the New Age Steppers, Mark Stewart decided to pursue a solo career as Mark Stewart & the Maffia. His friend, production genius and ON-U sound owner Adrian Sherwood, took care of production and mixed the Maffia on their various tours. With Doug Wimbish, Skip McDonald and drumming talent Keith LeBlanc Stewart recruited a truly exceptional rhythm section who had previously played with the likes of James Brown, Madonna, Africa Bambaata, George Clinton, Tackhead and many others. Considered seminal milestones by many of his peers and fans, the solo outings by this ‚godfather‘ of Bristol’s eclectic music scene blend the most diverse of genres in a unique and unconventional mix of dub, funk, punk, techno, electro, noise – spiced up with a generous dose of Stewart’s trademark political lyrics and slogans. Albums like ‘As The Veneer Of Democracy Starts To Fade’ or ‘Learning To Cope With Cowardice’ have left a lasting mark on the current music scene: icons in their own right like Massive Attack, David Bowie, Nine Inch Nails, Carl Craig, Asian Dub Foundation and Nick Cave call Mark Stewart’s work a decisive influence. On Edit, Stewart adds some unusually melodious touches to his inimitable vocal delivery (Loner, Rise Again or Secret Suburbia), slips in a smattering of his familiar, forceful cut-up collages (Freak Circus, Radio Freedom, The Puppet Master) and gives us the almost delicate, abstract Almost Human plus a very odd, and oddly refreshing cover version of the Yardbirds’ Mr You’re Better Man Than I (featuring Ari Up of The Slits). The travel journal of an exceptional artist, Edit proves that Mark Stewart continues to defy all categorisation. From August 2008, the documentary ON/OFF: Mark Stewart - from the Pop Group to the Maffia by Tøni Schifer will be gracing selected cinemas and film festivals. The film retraces the singer’s steps and paths from the early days of The Pop Group right up to the present. Schifer, who followed Mark around for a full two years, has crafted a detailed, often intimate portrait of the artist, supplemented by interviews with a. o. Mark Stewart himself, Adrian Sherwood, Daniel Miller (Mute), Nick Cave, Mick Harvey, Doug Wimbish, Skip McDonald, Keith LeBlanc, Douglas Hart (The Jesus & Mary Chain), Fritz Catlin (23 Skidoo), Jon Spencer, Gareth Sager (The Pop Group, Rip Rig and Panic) and many others, plus live recordings and music clips. The DVD will be released by Monitorpop in October.